Stephen Covey tells the story of a man who came through a forest when he meet a frustrated lumberjack. The lumberjack was trying to cut down a tree and was swearing and cursing. "What's the problem?" The man asked. "My saw's blunt and won't cut the tree properly." The lumberjack responded. "Why don't you just sharpen it?" "Because then I would have to stop sawing." Said the lumberjack. I think we can learn a lot from this story. In my time I have met software engineers who struggled with a similar kind of a dilemma. Do I stop and optimize my work environment so I can work more efficiently - or do I keep pressing on? To me this even represents the ultimate struggle of life itself. Every day we face new challenges and we try to overcome and to perform as efficient as possible. I invite you to take the time and to stop and talk to the lamenting lumberjack. In the majority of cases the response you will get is something like “sure this works for Unicorns like Google and Facebook! but not for us”. 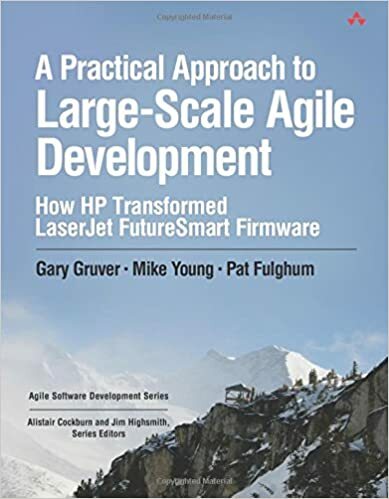 Gary Gruver in 2008 transformed the struggling HP laserjet business and the project and learnings have been very well documented. “Large-Scale Agile Development” has been proven in the field being “applied with horses AND unicorns alike”. The approach is not focusing on a particular tool like scrum but on “solving the problem on how teams work together”. What I like most with Gary’s formula is that it is centered around “business objectives” and NOT “tools”. So the formula helps you tailor the solution to your organizations problem not just stocking new tools. Or as Gary puts it “you end up with a Water-Scrum-Fall if you do not solve this!”. Again, don’t do things to do things (Jenkins, CI, Agile, DevOps, Lean)… do things that drive your business! Don’t get lost in the practices - pull back to the principles! I also can recommend Gary’s book as full of resources and insights. I always keep it handy together with my Toyota-Kata book. Again the mantra of Gary’s formula: “Either automate, eliminate, or engineer OUT the drivers that aren’t key to the value proposition”. By turning the path into this simple formula it makes it very easy to get started and to stay focused and on track. If you look closely into this formula you realize that “automation” (like automated deployments and tests) is considered key as enabling technology for scaling software development. Lets hope every IT-Organization soon finds a qualified IT Manager (Ladys?) who is able to deliver this kind of structured execution! Don’t wait for permission or the perfect day! Start working efficiently today.